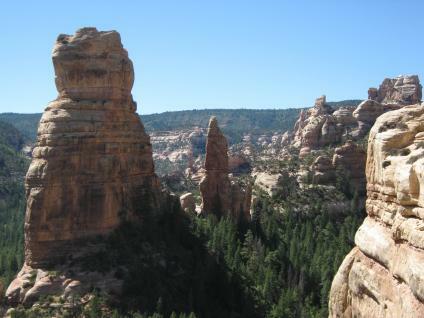 An energy firm linked to uranium mining interests around Bears Ears National Monument in Utah met with a senior Department of Interior official just one month President Donald Trump issued a surprise request to review the monument's boundaries. When the review concluded, Trump shrank the monument by 85%. Some 100 uranium claims that were previously *inside* the monument's protected boundary were suddenly on the outside. They sent an invitation to Ryan Zinke, who led the Department of the Interior under Trump at that time and was forced to resign in disgrace over other corruption charges. Roll Call reports that documents show that Energy Fuels Resources (USA) Inc., a United States subsidiary of a Canadian energy and mining firm, met with a top DOI official who knew he'd be personally involved with such a review, before Trump requested it. In December 2017, Trump, following recommendations by former Interior Secretary Ryan Zinke that were developed during the review, significantly reduced the size of Bears Ears National Monument and Grand Staircase-Escalante National Monument. The Natural Resources committee is scheduled to hold its first oversight hearing on the monuments review on March 13, said Adam Sarvana, communications director for Democrats on the panel. The committee has invited Zinke, who resigned and left in December 2018 amid corruption charges, to attend. It also invited Interior to send a representative. Both declined. IMAGE: Cliff formations at Bears Ears National Monument.